The List View panel is handy for when you want to see all of the elements that have been added in an easy-to-read list view. The first column displays the elements that have been added to the panorama. They are represented with their icons found in the Viewer. Type – All elements have different types. This column will show the type of element used. For example, whether a patch is an image or mirrorball or if the lens flare is a simple or bright sun lens flare. Description – Information about the element. Hover your mouse over any list item to get information about that element. You can use the List View to find any element added to the Viewer (hotspots, sounds, lens flares, etc.). Just double-click an element, and it will be brought to view and active in the Viewer. Elements add to the Viewer can also be deleted/removed in the List View. Click the x on the right side of the list to remove the element from both the List and the Viewer. List items can be rearranged by dragging the tabs on the left. When you have multiple patches, for instance, this changes their layering. ✭ Note that list items are grouped by type and the types cannot be mixed. If there are a number of point hotspots and patches, for example, you can reorganize the patches but you cannot move a patch between point hotspots. 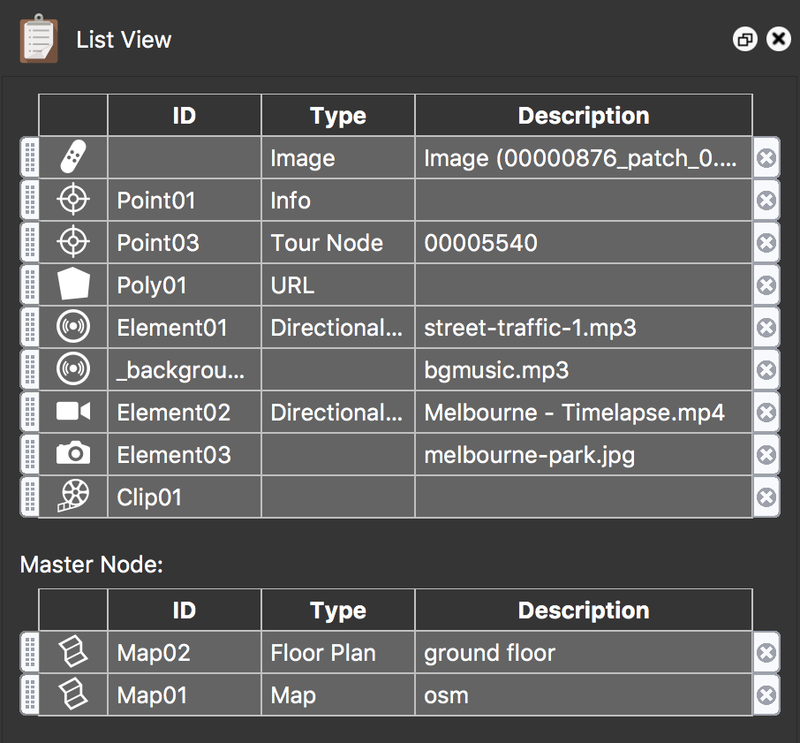 You can also use list view to navigate through your tour pressing the Alt or Option key and clicking a hotspot. This will take you the node it is pointing to. Hover your mouse over the list item, and you’ll get an overview of the target node. You can copy hotspots from one node to another. Just choose Copy from the context menu and then select any node in the Tour Browser you’d like to copy them to. Then, in the List View, right-click and choose, Paste.